Spring cleaning on an epic scale takes place Saturday, May 9 in New York City and throughout the Hudson Valley, so get your rubber gloves ready. That's when Riverkeeper holds their fourth annual Riverkeeper Sweep—a day of service to scour the banks of the Hudson River and remove the trash and tires and beer cans and all the man-made stuff that damages the environment of our beautiful waterway. At last year's event, there were 82 projects powered by 1,900 volunteers doing the good work. They removed 31 tons of trash and recyclables. 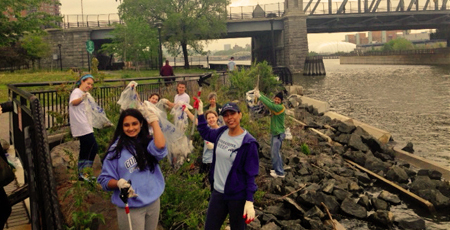 If you want to put together a team or service project for May 9, Riverkeeper would love to hear from you.